A listing of healthcare transactional lawyers who can help you decide on the best course of action for you and your business. Click here to create your complimentary personal profile for the directory. Who are the top healthcare transactional lawyers? 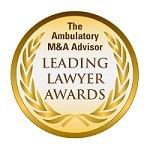 HealthcareTransactionLawyers.com is part and parcel of The Ambulatory M&A Advisor© publication 2014. All Rights reserved.